The UK has plenty of great places to explore. Grab your walking boots and take your family to Cumbria where you can climb to the top of Scafell Pike, kayak on Lake Windermere or bike through Grizedale Forest. Perhaps you prefer a beach destination? Then visit Cornwall or Devon where you can walk along the seafront and maybe try your hand at surfing. But where exactly should you stay when you're taking a short staycation break? A hotel or an Airbnb property? A hotel stay is often more luxurious than an Airbnb property, with room service, breakfast and a swanky cocktail bar on offer. However, Airbnb accommodation can also have its perks. First of all, it is likely to come with its own unique 'quirks' that you just don't get from a hotel room. You can also opt to rent a whole property to yourself meaning you get much more privacy. So, what's the difference when we compare prices? 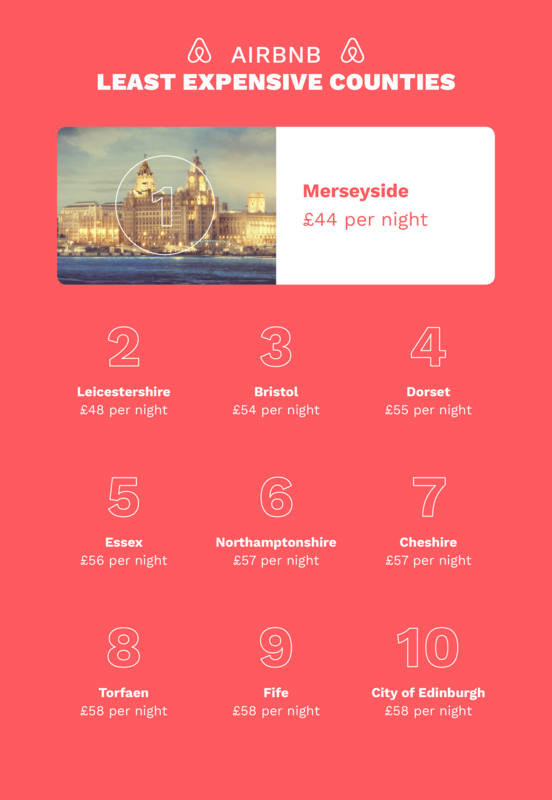 Here at Witter Towbars, we have been collecting the data and crunching the numbers so that we could find the average cost of a hotel room and Airbnb across every UK county. On average across England, the price of a hotel room is £100.87, which is £30.77 more expensive than staying in Airbnb accommodation, of which £70.10 is the average. In some areas, the price difference between the two types of accommodation is extremely minimal. In West Yorkshire, South Yorkshire, East Riding of Yorkshire and Rutland, the difference between the averages was less than £5. In contrast, there are areas where you'd definitely opt to stay in an Airbnb property if you wanted to save yourself some cash. In Merseyside, Bristol and London, the difference exceeds £100. There were only five areas of England where Airbnb prices exceeded the average price of hotels in the area. In Bedfordshire, the Isle of Wight, Lancashire and Northumberland, the average cost of Airbnb's in the area were more expensive. 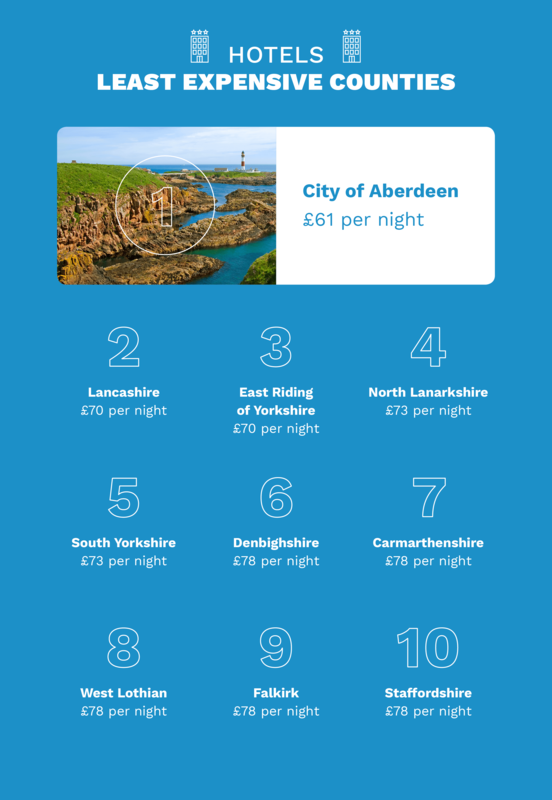 Northumberland emerged with the most notable difference, with the average cost of staying in an Airbnb property sitting at £29 more. When it comes to comparing the average hotel price in Scotland to that of England, there is barely a difference, with the price sitting at £97. The cost of an Airbnb is slightly higher than England, with a one night averaging £76.20. The difference between hotel and Airbnb prices in Scotland is just £20.80. 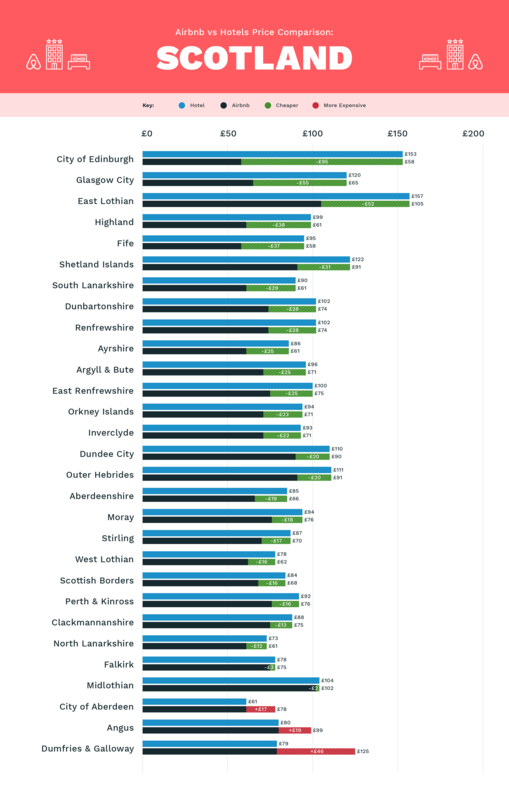 While hotels are more expensive overall, there was less contrast between averages across different areas of Scotland. Unlike price differences in England, the contrasting figures did not exceed £100. The biggest difference between the two types of accommodation emerged in Edinburgh, with a hotel costing £95 more than an Airbnb. A difference of £55 was found in Glasgow and £52 in East Lothian. In the City of Aberdeen, Angus and Dumfries & Galloway the average price of staying in an Airbnb emerged as the more expensive option. With a difference of £46, Dumfries & Galloway had the most noticeable difference. Wales broke the trend. Surprisingly, staying in a hotel in Wales may be the most cost-effective accommodation, according to our study. The average price of a hotel is £112.63 compared to a £134.95 average for Airbnb properties. The average cost for both a hotel room and an Airbnb makes staying in Wales more expensive than staying in England and Scotland. 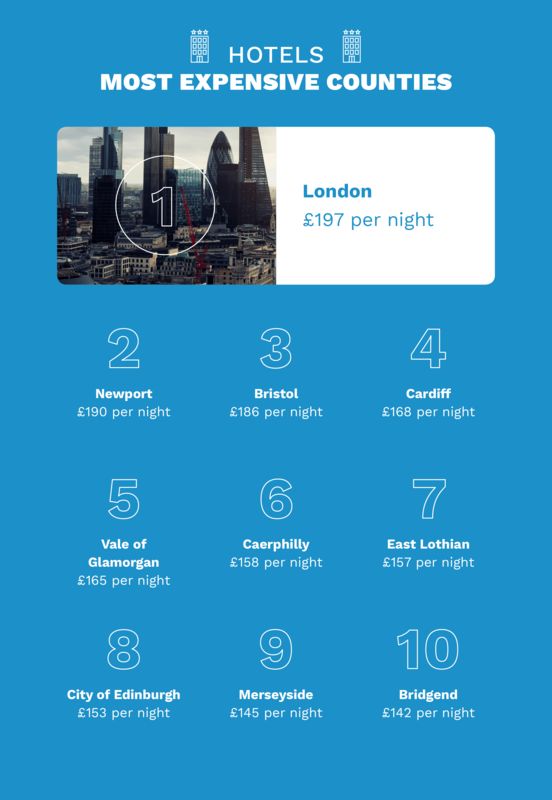 While Airbnb prices emerged more expensive, it could be argued that multiple Airbnb properties in Cardiff, Caerphilly, Newport and the Vale of Glamorgan that were extremely expensive, raised the overall average. 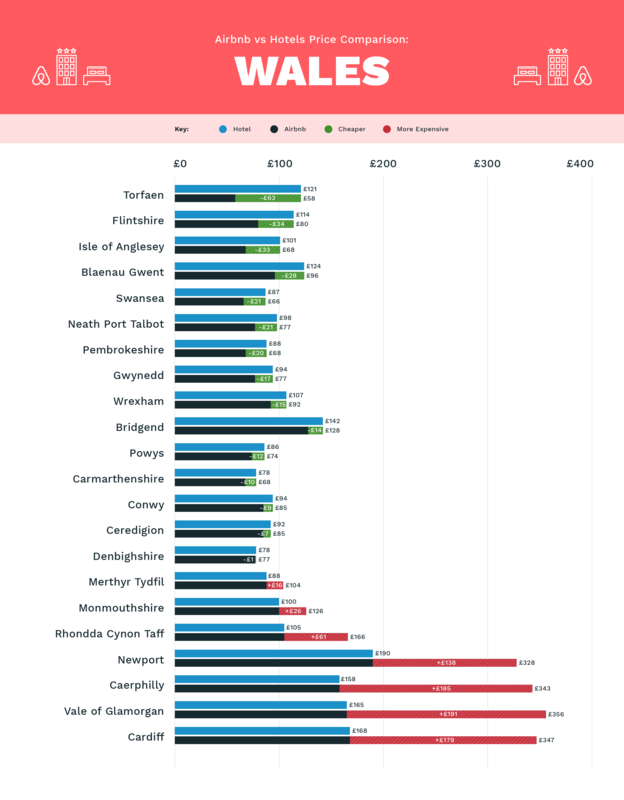 In these four areas there is a significant difference between the two property types, with the average Airbnb cost amounting to £191 more than a hotel in the Vale of Glamorgan. Across all counties in Wales, seven had Airbnb averages that were higher than hotel averages. Only Denbighshire had a price difference that was less than £5. Northern Ireland managed to steal the title of most expensive hotel average away from Wales, with the overall figure sitting at £114.33. However, the average price of staying in an Airbnb is £72.50, which cheaper than Wales and Scotland. Airbnb property was a cheaper accommodation option across all areas of Northern Ireland. 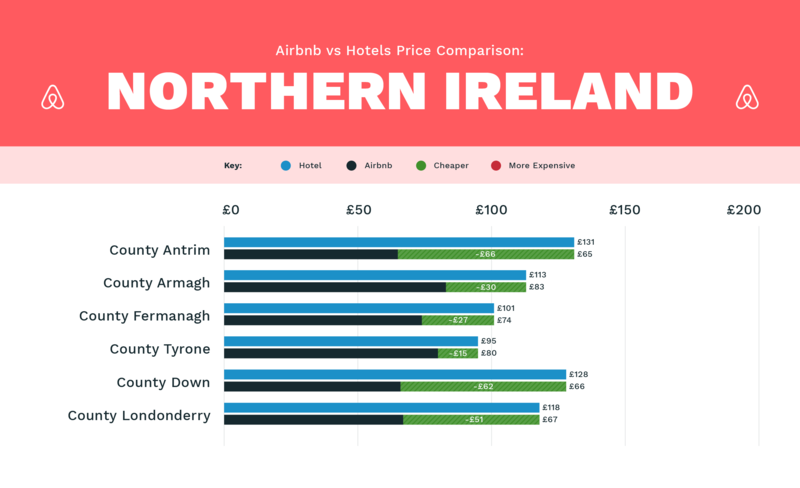 County Tyrone offers the least variation in price, with a £15 difference. In contrast, County Antrim had the biggest variation at £66. It's probably no surprise that London has the most expensive hotel prices in the UK at £197. This was followed by Newport and Bristol. In contrast, the City of Aberdeen proved the least expensive place to book a hotel at £61 per night. This was followed by Lancashire and the East Riding of Yorkshire. 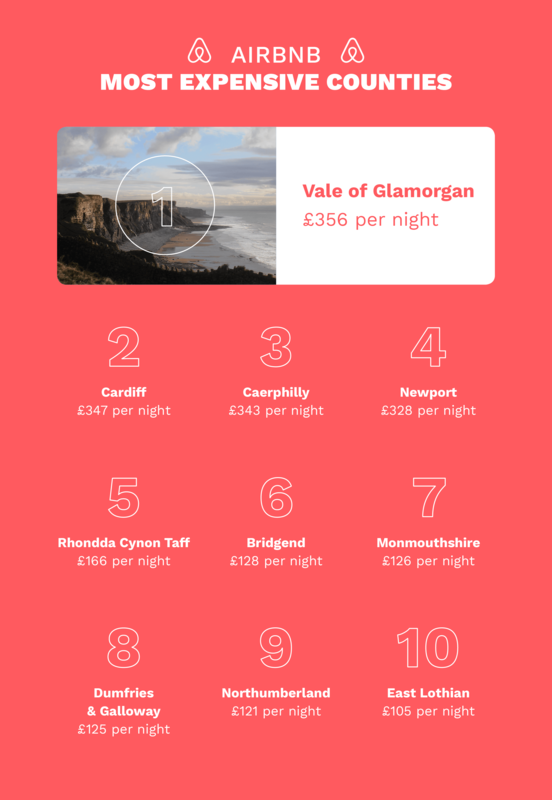 The Vale of Glamorgan proved to be the most expensive area to book an Airbnb property at £356. Unfortunately for Wales, this was followed by Cardiff and Caerphilly. At the other end of the pricing table is Merseyside. The average cost of an Airbnb property in this area is just £44. This was followed by Leicestershire and Bristol. The diversity of prices that this study uncovered is a positive thing. It means that the UK has a place to explore to suit lots of budgets. Whether you're looking to stick your bikes on a cycle carrier and go off-grid for a cycling holiday or you're wanting to explore some of the UK's vibrant cities, you can make your stay affordable. So, what are you waiting for? Make sure you have an adventure in the UK this year. The prices included in the study were scrapped from www.airbnb.co.uk and www.booking.com. Hotel prices for each county is the average cost based on 2 adults on a one night stay, dating 17/03/2018. This includes all star ratings. Airbnb prices for each county is the average cost for 2 adults staying in a whole property or a private room for one night, dating 17/03/2018. Please note that this does not include properties offering shared bedrooms. Witter Towbars acknowledges that the average prices founded by this study may fluctuate depending on demand/local events.